18 year old Lainey Pike is reeling from three recent deaths in her family including her mother’s suicide. Unsure about what to do with her future, Lainey pushes away her long-term boyfriend and high school friends, immersing herself in the care of her troubled 5 year old brother with her estranged older sister and hanging out with "slurpee guy". I think Lainey’s voice is done extraordinarily well. As someone who experienced a similar spate of deaths in the family when I was 19, I can vouch for the authenticity of Lainey’s prickliness. The bitchy way she dealt with her boyfriend, poor, understanding Riley, was a lot like they way I treated my college roommate freshman year (poor, understanding Lua – thank you for putting up with me!). I really loved Lainey’s realization that certain people come into your life for a particular reason, and not all relationships need to endure for you to grow and to get something out of them. The novel also ended on a perfect note, which definitely warmed up my feelings towards it. What I wasn’t so crazy about was the lack of a strong narrative arc. Instead we get a series of episodes, which realistic as they were, started to get boring after a while. Also, Lainey went off on far too many tangents for my taste – most where she related past events in far more detail than I really thought necessary (such as listing what she had done for each of her 18 birthdays!!). It’s definitely not flashy, but if you like deep explorations of character and don’t mind an absence of urgent, driving plot, then you’ll probably find THE SNOWBALL EFFECT to be as ultimately rewarding as I did. 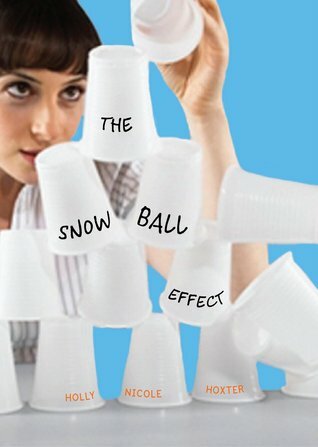 THE SNOWBALL EFFECT was released recently in hardcover. Find out more about it on the author’s website. Ooh! I have a friend who needs to read this book! And it's right in time for her birthday! It sounds like the book has some flaws but is still worth reading. The premise certainly sounds interesting. I agree with Dar that the premise does indeed sound interesting. I may have to read this one. I've been hearing a lot of mixed reviews on this novel. I think greif is such a hard topic to write about, because everyone deals with grief in such profoundly different ways that your never going to be able to connect with readers on a personal level, even if they may have been through a similar situation. It does sound good nonetheless. Great review! I love great characters, but I like some plot too, so this may not be the book for me. This reminds me a lot of an updated and modern version of Judy Blume's Tiger Eyes. Did you ever read it? Very interesting post, it sounds like a wonderful book that I need to buy. This sounds like a good book especially when you know that it might not "go anywhere". I think a lot of the time we can read a book search for that "something" to happen and once you realize it's not that book, then things are okay. I am not sure about this book. On the one hand, I love deep character driven novels, but I also think that the lack of plot and episodic feeling would irritate me. Thanks for your revealing review, it has helped me discover that this book might not be the right fit for me.